Zuke's has 2 yummy ways to make eating fruits & veggies fun. I confess, just like some human children, I don't really enjoy eating fruits & veggies. I will beg for food and lick up bread crumbs at the same time I am ignoring the raw carrot or green bean on the floor. I don't care how many hours it's been since I ate breakfast, I refuse to eat that vegetable. However, thanks to Zuke's Supers and Z-Bones, I get all of the healthy antioxidants I need. These treats are delicious! I sniff and paw at the bags to tell Mom I'd really like a Zuke's treat - now, please. Zuke's Supers and Zuke's Z-Bones are made in the USA. There are no meats or cheeses, or artificial flavorings in these treats. They actually make the fruits & veggies taste good to me. I love the soft, chewy texture. Ok, so sometimes I do like regular berries. I think my favorite berries are the blueberries from a human's yogurt cup. 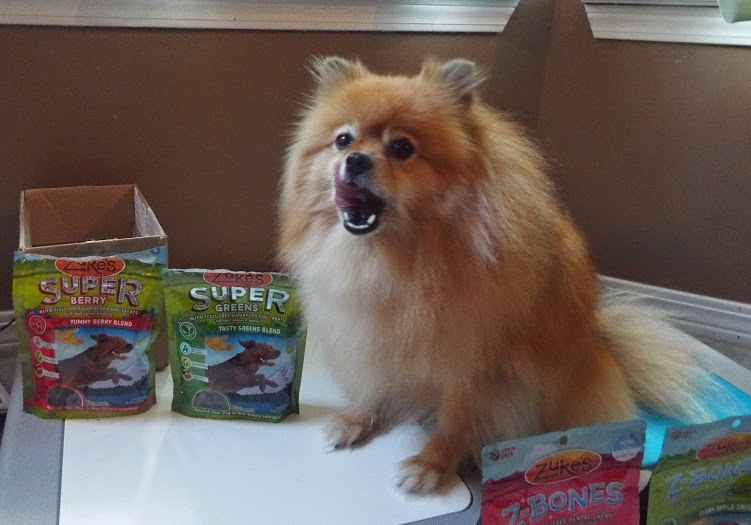 Mom was sure I would love the Super Berry treats, and she is right. They are super yummy! Ground Oats, Tapioca, Beets, Vegetable Glycerin, Cranberries, Blueberries, Gelatin, Molasses, Raspberries, Blackberries, Cherries, Sunflower Oil, Natural Vegetable Flavor, Phosphoric Acid, Sorbic Acid (a preservative), Rosemary, Turmeric, Cinnamon, Citric Acid, Mixed Tocopherols. Mom wasn't so sure if I would like the Super Greens. She knows I hate green beans. I do eat food that has greens like kale or spinach, and I think a few steamed peas are a treat. However, I'm not thrilled about canned peas. 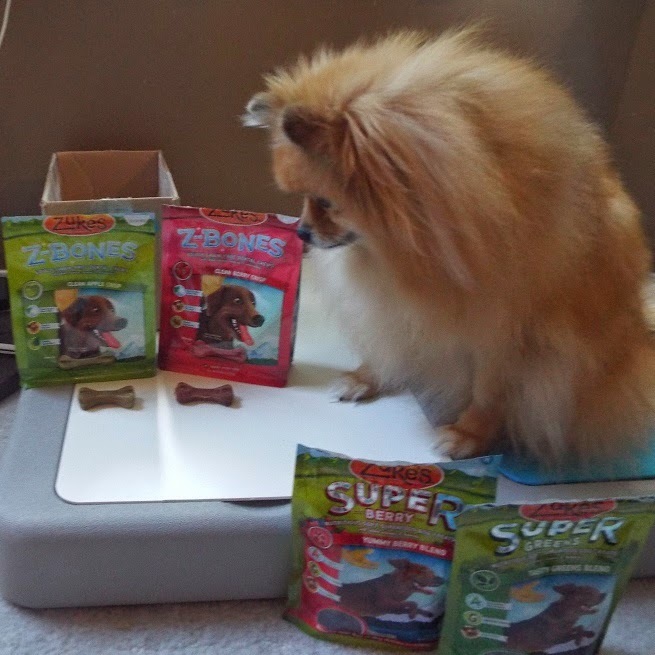 To Mom's delight, I adore the Super Greens treats as much as I do the Super Berry treats. She lets me pick which Super I want, and she never knows which bag I will pick because I like them both. Ground Oats, Alfalfa, Tapioca, Vegetable Glycerin, Green Beans, Spinach, Gelatin, Molasses, Sunflower Oil, Natural Vegetable Flavor, Broccoli, Peas, Asparagus, Kale, Cabbage, Kelp, Phosphoric Acid, Sorbic Acid (a preservative), Rosemary, Turmeric, Cinnamon, Citric Acid, Mixed Tocopherols. Zuke's Supers are low gluten because they use oats instead of other grains. They are named Supers because all of fruits, veggies, & oats in them are considered to be superfoods. Mom is happy that Zuke's Supers give me the healthy antioxidants that are found in fruits & veggies. 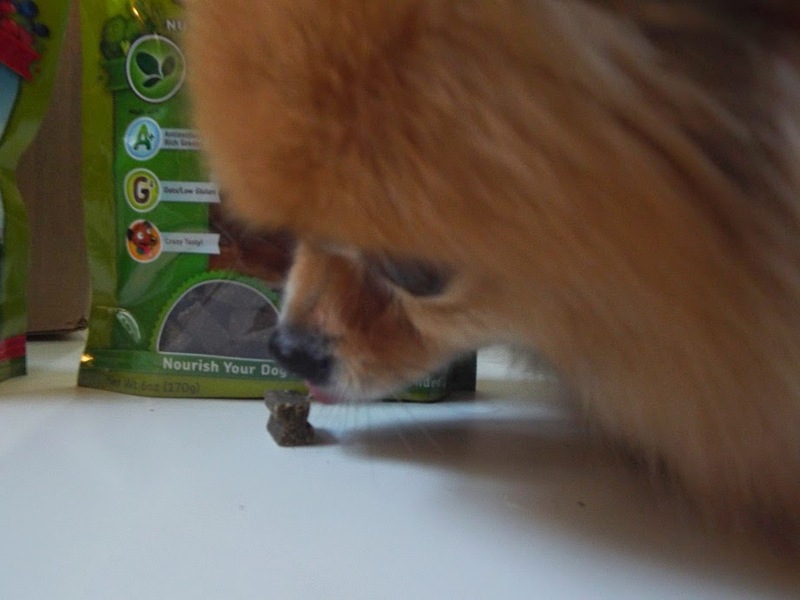 These yummy treats are sort of like a multivitamin, but I can have more than one a day. BOL! Note: Zuke's Supers are also available in Betas (pumpkin, carrots, squash & sweet potatoes). For as long as I can remember, people have been saying "dog breath" like it is a bad thing. 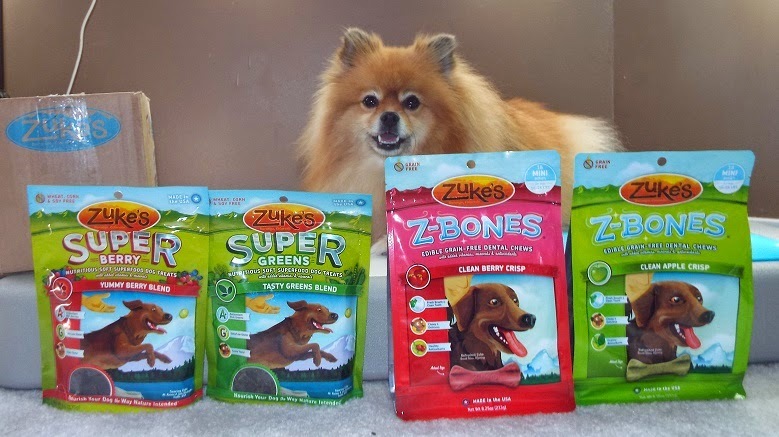 Zuke's wants to freshen your dog's breath with Z-Bones. Z-Bones are grain-free and use natural fresheners like parsley and rosemary to help freshen a dog's breath. The herbs used to freshen breath do so by supporting digestion. Z-Bones also help to freshen breath by scraping plaque off of teeth. They have a firm chewy texture that helps scrub your teeth. Let me get this Z-Bone in just the right spot to scrub my back teeth. Potato Flour, Peas, Tapioca, Vegetable Glycerin, Pea Protein, Cherry, Cranberry, Lecithin, Natural Flavors, Beet Powder, Citric Acid, Zinc Propionate, Alfalfa, Parsley, Rosemary, Turmeric, Fennel. Potato Flour, Vegetable Glycerin, Peas, Tapioca, Pea Protein, Apple, Spinach, Lecithin, Natural Flavors, Parsley, Citric Acid, Zinc Propionate, Turmeric, Alfalfa, Rosemary, Fennel. 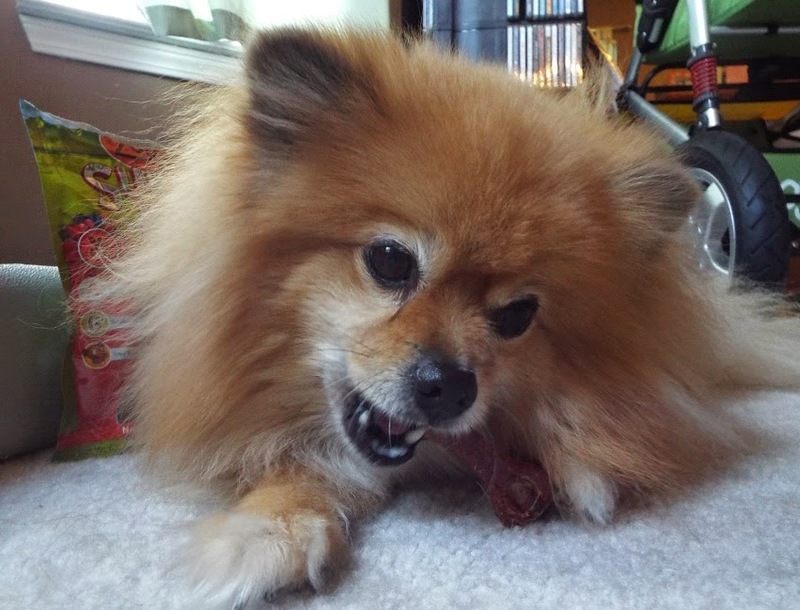 Naturally, a chew only works if you actually chew it. BOL! I can assure you that Z-Bones are fun to chew and delicious! I wish I could have more than one a day. As an added bonus, Z-Bones are full of antioxidants from fruits & vegetables, just like the Zuke's Supers. 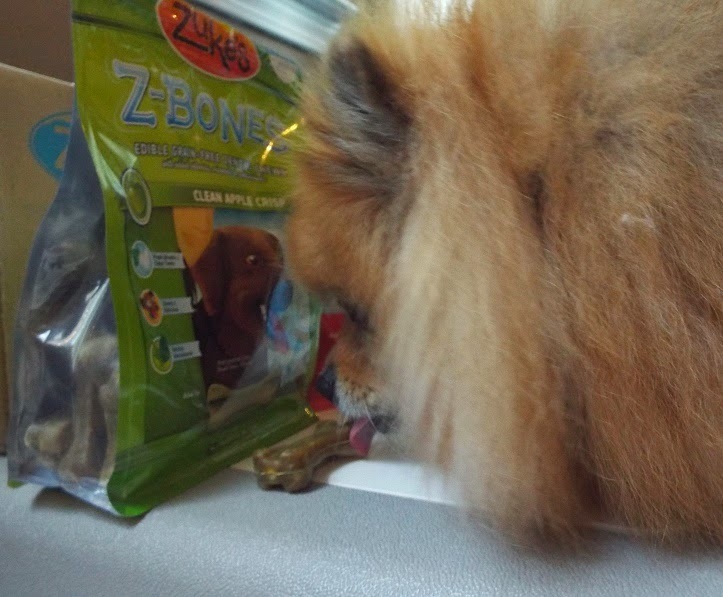 Z-Bones are a furrific and delicious way to freshen my breath, clean my teeth, and get some healthy antioxidents. 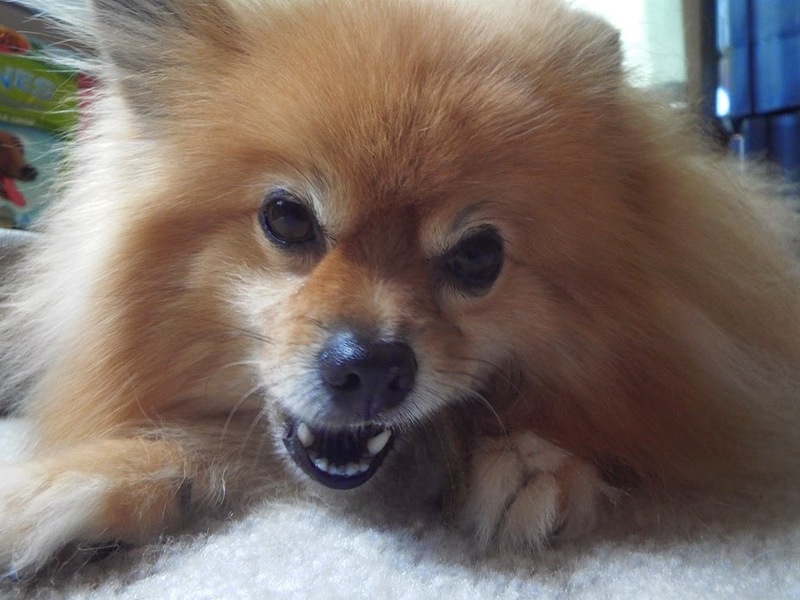 Dogs should always be supervised when given any dental or recreational chew. Note: Zuke's Z-Bones are also available in Clean Carrot Crisp. Caution: Z-Bones are not meant for dogs under 10 pounds, or puppies younger than 6 months. Are you ready to win some Zuke's treats? 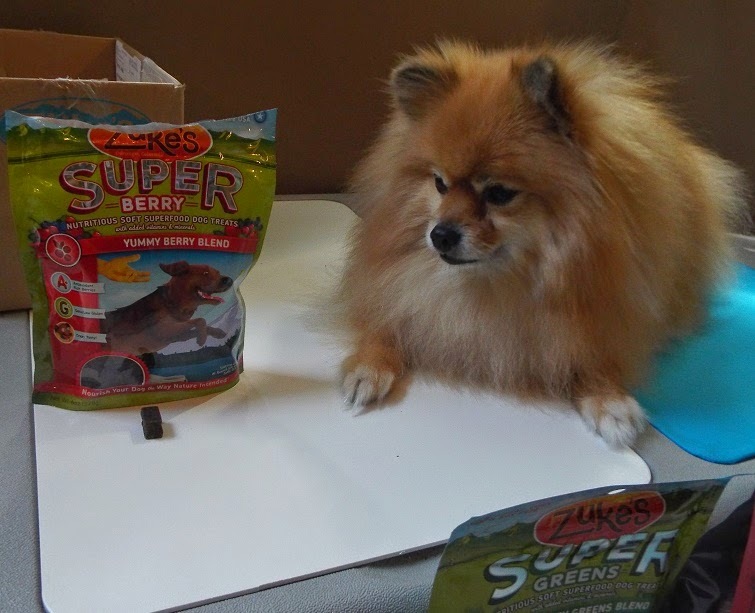 Zuke's will send one Pepper's Paws reader a set of Zuke's Supers, and a second reader will receive a set of Zuke's Z-Bones! Giveaway Disclosure: I did not receive any compensation for this giveaway. Zuke's will ship the prizes directly to the winners of the giveaway. I am not responsible for lost/missing prizes. The opinions in this giveaway are my own and not influenced by any outsider. Yes my little guy loves veggies, especially string beans and asparagus! And yes, absolutely he has bad breathe! I try brushing his teeth, but sometimes that is not enough! My dogs take after me - we all love fruits and veggies. I don't think I have "dog" breath but my dogs sometimes do. We are so Pro veggies. These treats look healthy and delicious. We would love to win some for our organization. Both my pups love the Zukes Z-Bones. I was surprised because when we first brought Killa home she wouldn't eat any of the treats we had. She came with a bag of Good-o's, which is basically the dog equivalent of a McDonalds cheeseburger. I greatly dislike veggies, I will eat fruits my mommy gives me but veggies are a big no no. Maybe I will like these! I have eight doggies, including they're rescues. The rescues are a long hair chihuahua a sheltie and a pit bull and yeh others are all shelties. All of the shelties LOVE any fruit or vegetable I allow them to have. They go crazy for zucchini, broccoli, lettuce and tomatoes as well as yummy fruits. The other two do not like fruits and veggies but will eat fruit and veggie treats. 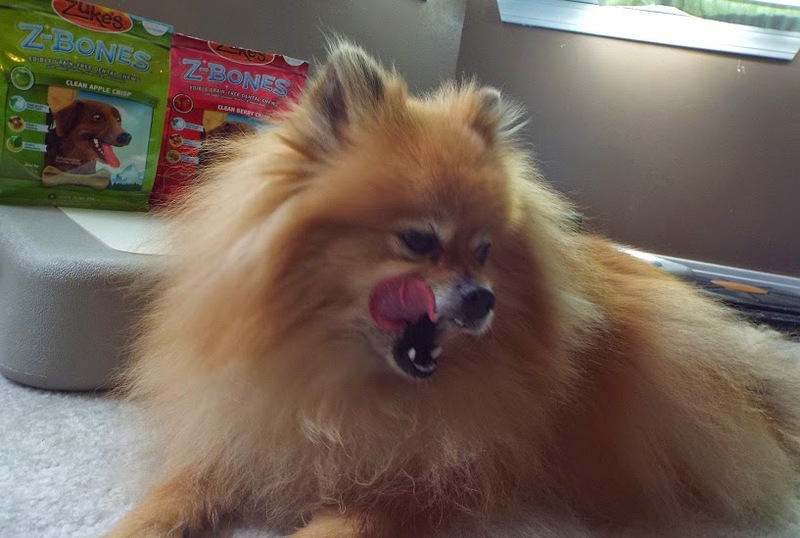 And as for doggie breath, as long as they get yummy things to chew on regularily the doggie breath stays away. So, when we are greeted by doggie breath I know it's time to break out some chews! My dogs would love to try any of these treats. Thanks for the chsne to win!